Was Bruce Jenner texting? Cops to check mobile phone records. Home Scandal and Gossip Was Bruce Jenner texting? Cops to check mobile phone records. Los Angeles police have sought to check mobile phone records to determine if reality star Bruce Jenner was texting at the moment his car crashed into an automobile as driven by now identified 69 year old fatal victim, Kim Howe. Whilst Jenner escaped the ensuing four car pile up as Howe’s car was fatally knocked into oncoming traffic, the driver of the vehicle who Jenner bumped into was killed whilst seven other passengers from two other vehicles were injured and taken to hospital. 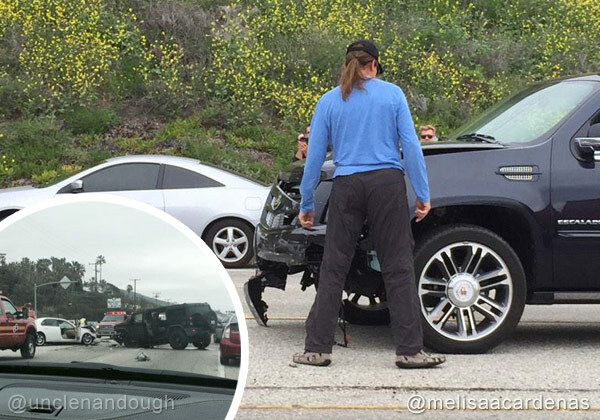 At the time of the accident, Bruce Jenner told that he had been chased by up to five paparazzi, but witnesses have since discounted that claim, telling that it appeared that Jenner may have been on a mobile phone causing him to lose his focus on the traffic ahead. Police have stressed that all parties involved will have their phone records to check if anyone of them had been preoccupied on a mobile phone, not just the reality star himself. The new tact comes with cops telling that there is no evidence Jenner was being chased by photographers at the time of the collision reiterated Los Angeles County Sheriff’s Department Lt. John Lecrivain. He told CNN: ‘As of right now, there is no indication that Bruce Jenner was being chased by paparazzi at the time of the crash. Photographs showing the crash impact appear to show Jenner, who is dressed in a blue jumper with dark sunglasses on, with his left arm raised while behind the wheel. The L.A. County Sheriff’s Department will get a search warrant for both Jenner’s phone records and the cellphone itself,TMZ reported today. It is illegal to text while driving in California. 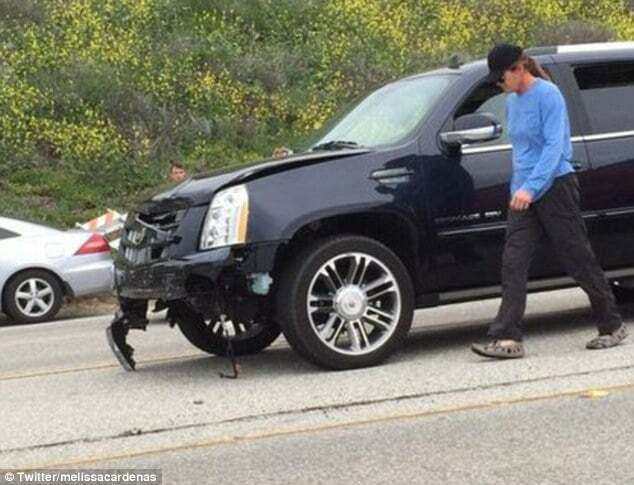 It is thought Jenner smashed his Cadillac Escalade into the back of the victim’s white Lexus, which was then pushed into the path of a Hummer, leaving the vehicle a crumpled wreck and the sole occupant dead. Five children – and two adults – were also hospitalised in the fatal smash which occurred just after midday on Saturday. The Olympic gold medalist and Kardashian family patriarch took a roadside sobriety test in front of officers in the wake of the horrific collision, which he passed, while his son Brody rushed to comfort him at the scene. Today it emerged that the crash victim – believed to be Kim Howe – lived in the same gated community in Calabasas as Kourtney, Robert and Khloe Kardashian. Jenner’s publicist, Alan Nierob confirmed that he hadn’t been hurt in the crash and he was pictured at the scene sitting in his vehicle and walking around on the road. He was later pictured being driven from the scene by sheriff’s deputies. TMZ would this morning release pictures showing that the reality star had been smoking a cigarette at the time of impact, as photographed by paparazzi, putting into doubt that he had been texting. Jenner told cops he was being pursued by paparazzi in the moments leading to the original crash, however a sergeant disputed the claims. Jenner passed a field sobriety test and voluntarily went to a nearby hospital to provide a blood sample. ‘He is not under and investigation right now as far as driving while intoxicated,’ the sergeant added. Yesterday’s incident comes amid speculation surrounding Jenner’s much-discussed private life following reports from close friends and family confirming that he is transitioning into a woman. There is speculation that Jenner is preparing to give a tell-all interview discussing the process as well as plans to make a documentary as he prepares to go public. Three-times married Jenner has been given the approval of his family including his 88-year-old mother Esther Jenner‘s support. As of Saturday evening, Jenner had not been arrested or charged with anything. Yet.